We’d love your help. 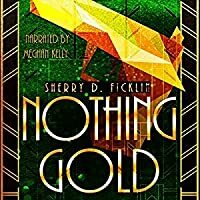 Let us know what’s wrong with this preview of Nothing Gold by Sherry D. Ficklin. Dickey Lewis has been down on his luck since the day he was born. Flat broke and sick of being looked down on, his meeting young socialite Lilly Rose at a wild party is like a strike of lightning. From a wealthy New York family, this debutante is everything he’s been told he can never have—and the only thing he wants. Determined to win her, he knows the only way to keep her from being married off to another fella is with cold hard cash, enough of it for them to run away and start a new life together. When a shot at the biggest score of his life comes around, he can’t refuse. One heist and he can have everything he ever dreamed of—or so he thinks. When things go sideways and he finds himself the unwitting pawn in a much larger game, he will risk it all for the dame he loves. But in a city on the brink of war, alliances of the heart can be the most deadly kind. To ask other readers questions about Nothing Gold, please sign up. Nothing Gold is the last in a three-part mini-series to introduce Sherry Ficklin’s new series called The Canary Club, which is expected to be released in October. Although I preferred the first story better, The Gilded Cage, this story is still an entertaining glimpse into the early 1920’s prohibition era. I can see why those who were reared during this era are called the "Lost Generation" where speakeasies and gangsters run rampant with headstrong young women and wandering young men. 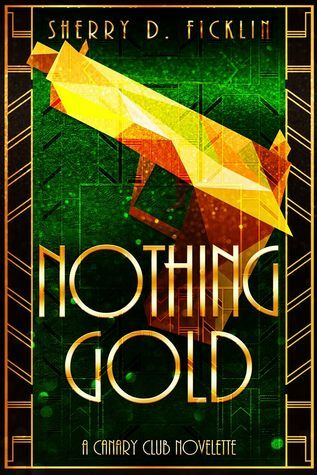 Nothing Gol Nothing Gold is the last in a three-part mini-series to introduce Sherry Ficklin’s new series called The Canary Club, which is expected to be released in October. Although I preferred the first story better, The Gilded Cage, this story is still an entertaining glimpse into the early 1920’s prohibition era. I can see why those who were reared during this era are called the "Lost Generation" where speakeasies and gangsters run rampant with headstrong young women and wandering young men. Nothing Gold introduces us to Dickey, Benny, and Lilly. Dickey is basically a kind and romantic young man who is down on his luck. He believes that if he can execute one last big score, he can break away from a life of crime and start over. When he sneaks into a well-known socialite's party to steal some riches, he meets Lilly who encourages him to take everything and then some more. Ultimately we find out that Lily has ulterior motives and she blackmails Dickey into doing something terrible. He then goes to his best friend and guardian angel Benny for advice, and Dickey is persuaded into telling the truth. The story ends with us wondering whatever happened to Benny and how could Benny make such an unselfish sacrifice for Dickey? I’m sure we’ll get those answers in The Canary Club, which, thankfully, is devoted to telling Benny's story. October can't get here fast enough! can't wait for the full length novel..I am sucked into these characters already. I should be used to this by now. What should you be used to, Sissy? I tell ya, I should be used to how Sherry Ficklin manages to ensnare and captivate her audience in such a short amount of words. How she develops these characters that leap off the page/screen and makes you feel immersed into their lives as well as the time period. This is the last in the three-part miniseries of the Canary Club, the first was Gilded Cage the second being All that glitters. It is a series that takes place in New I should be used to this by now. What should you be used to, Sissy? I tell ya, I should be used to how Sherry Ficklin manages to ensnare and captivate her audience in such a short amount of words. How she develops these characters that leap off the page/screen and makes you feel immersed into their lives as well as the time period. This is the last in the three-part miniseries of the Canary Club, the first was Gilded Cage the second being All that glitters. It is a series that takes place in New York City during the 1920s, the prohibition era. Where speakeasies and gangsters run rampant. We meet Dickey, Benny, and Lilly in this novel. Dickey is a down on his luck fella who just wants his big break in life, so when he sneaks into a well-known socialite's party to steal some riches, he's in for a big surprise when he meets none other than Lilly Rose. She's a hot ticket from the start and she's got a few tricks up her sleeve. But it's love at first sight for Dickey and all he wants is to prove himself worthy to Lilly Rose and he vows to meet her again. Gosh, as I was reading it I was enthralled and then frustrated and I again, as I usually do, find myself shouting WHY SHERRY WHY?! It left off in the perfect place for the main event, which is The Canary Club, which is Benny's book. Benny gets an ENTIRE BOOK.. and he deserves it! I absolutely cannot wait for the full-length Canary Club novel. With this trilogy of novellas, Sherry Ficklin has set up some fantastic characters. This latest installment proves she can write a male main character just as well as a female main. Each of the novellas is a story in and of itself, and remarkably well-developed for its brevity. Each novella is less than 100 pages, yet each has a fully developed plot. I get to the end and wish it wasn't over just because I want more of these characte I absolutely cannot wait for the full-length Canary Club novel. With this trilogy of novellas, Sherry Ficklin has set up some fantastic characters. This latest installment proves she can write a male main character just as well as a female main. Each of the novellas is a story in and of itself, and remarkably well-developed for its brevity. Each novella is less than 100 pages, yet each has a fully developed plot. I get to the end and wish it wasn't over just because I want more of these characters. Ms. Ficklin has obviously put time into her research - the period details are perfect for setting the stage. I really enjoy reading historical fiction where the dialogue never breaks time period - you won't find any of the characters using slang that's out of historical context. The dialogue is very realistic, and the characters well-developed.